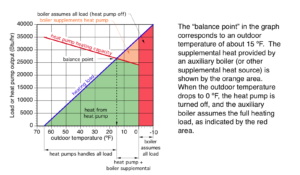 Heat pump balance point. Image courtesy of John Siegenthaler/APPROPRIATE DESIGNS. Specialists in the use of hydronic comfort heating. All rights reserved. This graph shows the balance point for a very efficient, state-of-the-art Air to Water CCHP. This example also assumes a tight, well-insulated conventionally-constructed building envelope. In this example you would begin to need supplemental heat at around 15º. 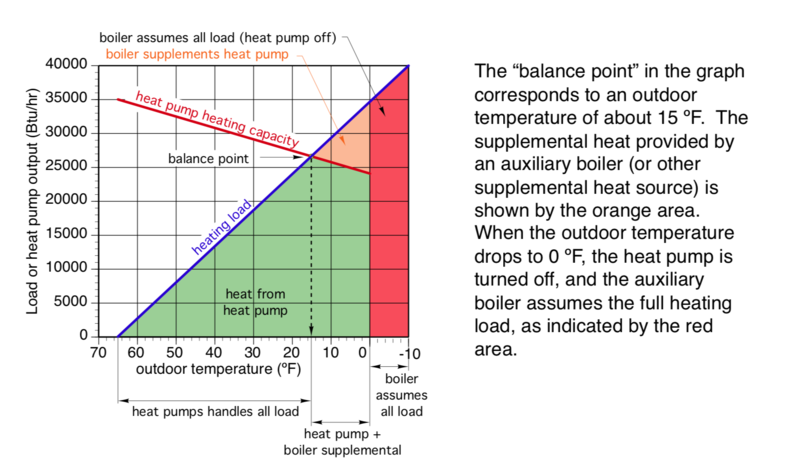 The two variables of heat pump heating capacity—the red line in the graph, and building heat loss*—the blue line in the graph. This will determine the temperature at which your particular heat pump can no longer keep up with the demand for heat. Figuring out the exact heat loss of a particular building is a complicated job for a heating professional. Your contractor will complete a Manual J calculation, but for practical purposes, a three-year history of your heating bills will provide a good estimation. If you want to drill down on heat loss calculations (hint: you don’t) here is a good article.